Blowout Sale! Free Shipping Included! Save 55% on the U2C Android 7.1 TV Box, [3GB RAM+32GB ROM] Amlogic S912 Octa Core Smart TV Box with 64 Bits H.265 Dual-Band WIFI 2.4GHz/5GHz,3D, 4K UHD, BT 4.1 Z Super Media Player by U2C at Home Entertainment Centers Online. MPN: 050072-US-1. Hurry! Limited time offer. Offer valid only while supplies last. 1. [Newest Android 7.1 OS]: Android 7.1 OS has a better compatibility of software, games and applications, better user interface and user experience. Compatibility with the latest android applications such as youtube, Netflix and many Games, and support for more USB devices. 2. 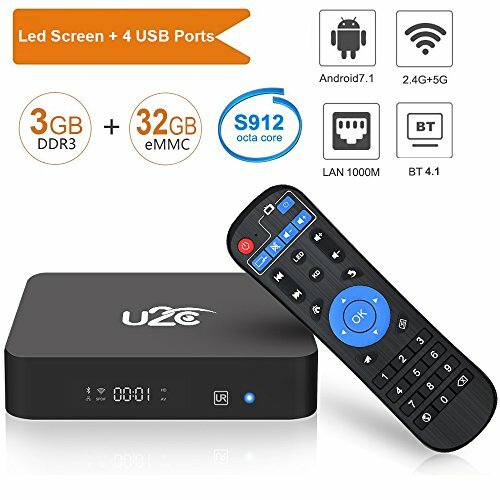 [High reaction speed]: Android tv box 3GB RAM 32GB ROM provides plentiful room to quickly start your apps and games without freezing and buffering, with expandable TF storage up to 128GB, it also greatly improves the reliability of your TV box and prevents crashes due to lack of memory. 3. [Support 3D+4K Function]: No need go to The cinema to watch 3D movie, Z Super tv box updated version support 4k and 3D function. You can 500,000+ movies and TV episodes from popular channels and apps including Netflix, Prime Video, Hulu, HBO, SHOWTIME, NBC, and more. 5. [Best Guarantee]: U2C TV Box have Worry-Free 12moth warranty and friendly customer service. Anytime you have question during usage, please contact us, our technical team will provide you professional problem-address solutions. If you have any questions about this product by U2C, contact us by completing and submitting the form below. If you are looking for a specif part number, please include it with your message.